First, a personal story; second, a library connection. Although I’ve been using the photo-sharing website Flickr for nearly a year, September was the first month in which I posted a new picture every day. That’s not an achievement by Flickr standards, of course. There are some dedicated “365” folks who not only post photos every day for a year, but put themselves into the shots day in and day out. That’s got to be stressful. My month went by with barely a glimpse of my own face. Instead, the 30 days of photographs (at right) document some of the people, places, and things I encountered along the way. In that regard, this compilation is quite astonishing to me — even though I lived it. I see some yard work; a published article; my daughter’s puppy; some hikes, bikes, and climbs; people I met; money I needed for a car; the car the money bought; and a spider I met face to face. 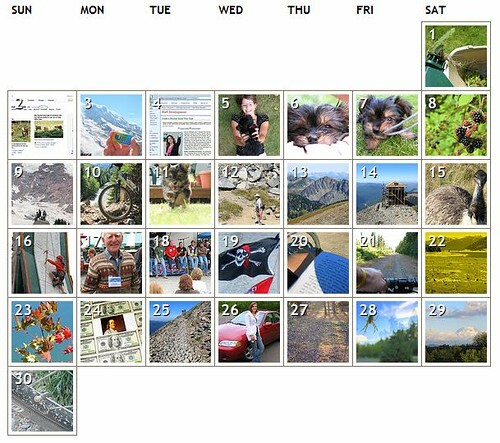 That was my month — packed together on a calendar grid and posted a few weeks ago on Flickr. We live life one day at a time, but don’t always see the quilt those daily patches make over time. This calendar is a quilt showing me just that. Libraries are part of the communities they serve. They’re often a very active part — sometimes central to the daily life of community events, programming, and resources. So why not show that pulse? Why not display the vibrancy of daily life? One photo at a time might not mean too much, but look at the same sort of calendar quilt done for a library. For nearly four months (until my schedule grew temporarily thick with other obligations) I posted daily photos to my library’s Flickr account. 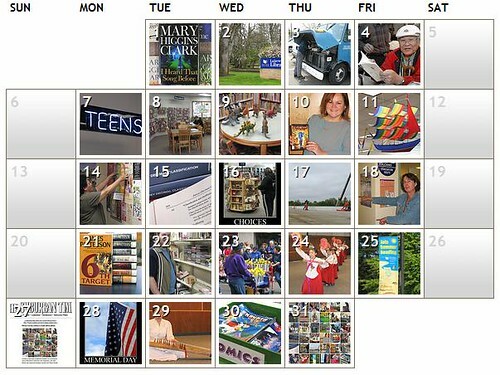 Seeing the calendar grid for just one of those months (May is shown here) we can reflect on programs, materials, the advent of summer reading, staff rolling bookcarts in a community parade, and a smattering of other scenes. This is the library. This is a vibrant community place. Collected and shared on a social site like Flickr (even if marketed in other ways*), photographs can demonstrate that. Libraries should show off their activities and share the evidence with the community. We should advertise the daily patches of life AND the whole quilt. Social sites and their tools can help us do both of those things. *The lone Sunday image in May celebrated the publication of a newspaper article featuring a 6×6 block from our Flickr images.